Sada Mire, a PhD student at the UCL Institute of Archaeology, has created a website to make research on African heritage available to academics and schools around the world. The website holds information and research into African heritage, archaeology, history, anthropology and ethnography conducted by students and academics at all levels at the Institute and other UK universities. Topics featured range from an introduction to Matopo National Park in Zimbabwe to developing a new archaeological curriculum for Nigeria. There are also research tools, news and events details for academics. In addition to the research community, the site also aims to inform the general public about the archaeologists' work to communicate the value and purpose of archaeology in Africa to the widest audience possible. To this end it will feature articles and summaries of projects in the future. 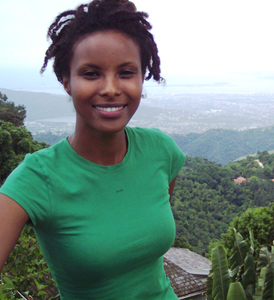 Sada, who is studying the archaeology and heritage of the Horn of Africa (Ethiopia, Kenya and Somalia), said: "I wanted to set up this website as a result of the lack of access to research into Africa's past that I experienced before I joined an academic institution. While it is important to share our work with academic community, it should be equally praiseworthy to disseminate research to the wider world. Even when research is available to people in the West through libraries, it is unfortunate that very few actually read it. It leads us to question the purpose of research if we are serving merely the archaeological community. "Making research more easily available is particularly pressing for those of us who work in areas of the world such as Africa, where local communities and even entire countries often lack any chance of accessing our research. One way of sharing our research with others is through the internet. This African Heritage and Archaeology website provides an opportunity for researchers to present their work to the public." Sada hopes that the website will be used by schools in the UK, Africa and elsewhere to enrich and diversify history lessons, and plans to use it in work with ethnic minority community groups in London. Next steps include forging partnerships with universities and research organisations to expand the site's offering and build interactive features. Sada will also be seeking funding to develop the site further.